I know that these are traditionnel rather than agricole, but was wondering if anyone could tell me a bit more about these rums. Nothing other than that they are private labels of unknown distillery origin. Only the best ist good enough! the NOSE hit the nail on the head with the comment "...better and sweeter than the taste is.". The taste has only the slightest hint of sweetness. Actually, it is hot to the tongue upon first sip. Cayenne and graham cracker are the dominant flavors (I'm working with a bad cold/flu on this one...). The finish is not great. A little bitter and medicinal, but not unpalatable. the NOSE, again, is correct. A ti punch would be a good call on this rhum. Overall, it is a pleasant surprise. It's $25 a one liter bottle in Texas. BTW, not an AOC rhum. Last edited by rumdog007; 03-03-2009 at 09:34 PM. Hi there, hope all of you are well. I live in England but have a Texan friend who has recently discovered St Paul rhum and loved it. Regrettably, he was told by the store owner that they would no longer be selling it. I wonder if you know of other stores stocking St Paul in the Pasadena area? I found it in Houston at Spec's. I don't know St Paul rhum, but the name probably means it comes from la Réunion, as the rhum was distilled in Savanna and Vue Belle and sold in the neighbour town of St Paul. 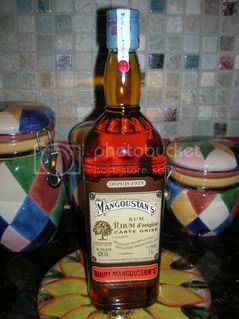 Mangoustan's is not a bad rhum, nor is it a top one. It is a hit in Madagascar (why, I don't know, a souvenir from the colonial times?) and produced locally there under licence by SODEAM, (also in Ivory Coast by SODIALCI (http://ecat.edatasync.com/Detailed/193/502.html)). http://www.euvs.org/fr/collection/sp...ne-carte-grise (the comment is wrong twice 1) the brand still exists - 2) the bottle shown does not date back in the 1900, as SLAUR-Chauvet is mentionned on the label). Hi, It could be may agricole. But i don't have any knowledge regarding this rum. I hear first time this names.